V.F. Corporation (VF) designs, manufactures, distribute and market branded lifestyle apparel, footwear and accessories. The company offers Jeanswear, outdoor and action sports, image wear, sportswear and contemporary brands. The company markets its products under brands namely, the North Face, Wrangler, Timberland, Vans, Lee, and Nautica, among others. It sells its products to specialty stores, department stores, national chains and mass merchants, as well as through direct-to-consumer channel consisting of VF operated stores and internet sites. VF forecasts to achieve $13.7 billion revenue in fiscal year 2019, up 11% 4.6 from 2018. Gross margin% of the company improved from 48.3% in 2016 to 50.5% in 2018 as benefits from pricing, lower product costs, and a mix-shift toward higher margin businesses. However, gross margin% was partially offset by changes in foreign currency and the impact of restructuring charges. VF’s centralized global supply chain organization is responsible for producing, procuring and delivering products to its customers. On an annual basis, VF sources or produces approximately 473 million units spread across more than 30 brands. In 2017, VF’s products are obtained from its 21 self-operated manufacturing facilities and approximately 1,000 contractor manufacturing facilities in over 50 countries. No single supplier represents more than 10% of VF’s total cost of goods sold. In 2017, 23% of VF’s units were manufactured in VF-owned facilities (up from 22% in 2016) and 77% were obtained from independent contractors. VF operates manufacturing facilities in the U.S., Mexico, Central, and South America, the Caribbean and Europe. A significant percentage of denim bottoms and occupational apparel is manufactured in these plants, as well as a smaller percentage of footwear and other products. For VF’s self-owned production facilities, VF purchases raw materials from numerous U.S. and international suppliers to meet their production needs. Raw materials include products made from cotton, leather, rubber, wool, synthetics, and blends of cotton and synthetic yarn, as well as thread and trim (product identification, buttons, zippers, snaps, eyelets, and laces). Products manufactured in VF facilities generally have a lower cost and shorter lead times than products procured from independent contractors. Independent contractors generally own the raw materials and ship finished, ready-for-sale products to VF. These contractors are engaged through VF sourcing hubs in Hong Kong (with satellite offices across Asia) and Panama. These hubs are responsible for managing the manufacturing and procurement of product, supplier oversight, product quality assurance, sustainability within the supply chain, responsible sourcing and transportation and shipping functions. In addition, VF’s hubs leverage proprietary knowledge and technology to enable certain contractors to more effectively control costs and improve labor efficiency. Substantially all products in the Outdoor & Action Sports and Sportswear coalitions, as well as a portion of products for VF Jeanswear and Imagewear coalitions, are obtained through these sourcing hubs. Products obtained from contractors in the Western Hemisphere generally have a higher cost than products obtained from contractors in Asia. However, contracting in the Western Hemisphere gives VF greater flexibility, shorter lead times and allows for lower inventory levels. This combination of VF-owned and contracted production, along with different geographic regions and cost structures, provides a well-balanced, flexible approach to product sourcing. VF intends to continue to manage its supply chain from a global perspective and adjust as needed to changes in the global production environment (VF Annual Report, 2015, 2016, 2017). VF has the goal of 40/40/20 for factory ownership. They want to own 40% of the factories they use, utilize the third-way approach in 40% of the factories, and use transactional sourcing for the other 20% (Glaser, 2014). Since its creation, VF has split its “Third-Way” factories into three different categories: light, medium, and heavy. Light Third-Way is having engineers consult with the factories and visit each week. The medium Third-Way involves having an engineer on site and a long-term commitment to the supplier from VF. Lastly, the heavy Third-Way involves profit-share and open book costing as well as sharing of research and development (R&D) (Barrie, 2015). Trust continues to be a central theme in Third-Way sourcing, as does having the right people on board with the initiative. VF also believes that any positive changes made to the factories because of the Third-Way program will ultimately help the whole industry and drive positive change, even if the changes are used for other companies that source from the same vendor (Barrie, 2015). In November 2018, VF announced to spin off the group’s denim and outlet businesses into an independent, publicly traded company in 2019. The new company, called “Kontoor Brands Inc”, comprises VF’s jeans brands, including Wrangler Lee, and the VF Outlet business. VF says that the move will sharpen its focus as a global clothing and footwear powerhouse focused on lifestyle brands such as The North Face, Timberland and Vans. A group of eminent panelists will bring their experience on how digital technologies are changing international trade and how international trade cooperation can help governments reap the benefits and address the challenges of digital trade. #1 Do you think it is a good move for companies to embrace the “China plus Vietnam plus Many” sourcing strategy, especially after learning about the working conditions in developing countries such as Bangladesh? Do you think this could backfire on companies? #2 Why or why not do you think sourcing from Asia will become less attractive relative to sourcing from the Western Hemisphere due to the increasing importance of “speed to market” in U.S. fashion apparel companies’ sourcing decisions? #3 As sustainability becomes more prevalent throughout the fashion industry, will there be a way to lower costs, while still creating garments that are better for the environment, and have transparency with consumers about factory conditions? Why? #4 According to the article, “more and more well paid and high quality jobs in the US fashion industry will depend on international trade and the global value chain.” How do you feel about the quality of the US fashion industry depending so heavily on factors outside of the US? Do you see this changing in the future, and if so explain how. #5 Most U.S. apparel companies have already shifted their businesses to non-manufacturing activities such as design, branding, sourcing and retailing. Is it still meaningful to give so much attention to apparel manufacturing in the U.S.? #6 When purchasing your garments from either online stores or brick-and-mortar stores, do you look to see what country your goods are produced in and on a scale from 1 to 10 with 1 being the least important 10 being the most important, how significant is it to you to know where your goods are coming from and how much of a factor does that play into your buying decision? #7 If it is predicted that more US fashion companies’ sourcing could be from nearshore due to automation technology, what would happen if they technology was implemented in a place where there were lower labor costs (for the people operating the machines)? Would the US continue to use nearby manufacturers or would they resort to wherever is cheaper? #8 Do you think “made in the USA” apparel is truly telling the whole story of the supply chain? Do you think that it is truly more ethical? Or do you think it is just a way for retailers to charge more for apparel? If producing products in the U.S. is much more expensive than importing products from other countries, how are companies such as Walmart able to sell products with labels that say “Made in U.S.A”? 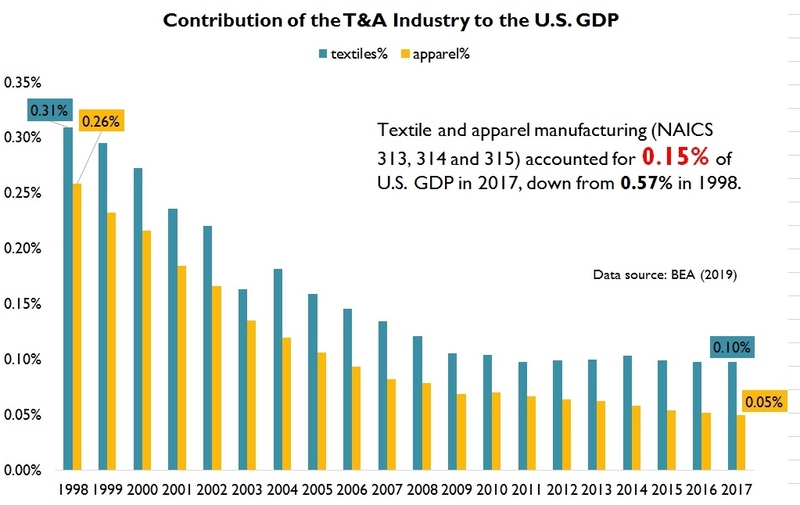 The size of the U.S. textile and apparel industry has significantly shrunk over the past decades. However, U.S. textile manufacturing is gradually coming back. Notably, the value added of U.S. textile manufacturing reached $18.88 billion in 2017, the highest level since 2009. Nevertheless, the share of U.S. textile and apparel manufacturing in the U.S. Gross Domestic Product (GDP) dropped to only 0.15% in 2017 from 0.57% in 1998, as the case in most advanced economies with a mature industrial system. It is also important to note that U.S. textile and apparel manufacturing is changing in nature. 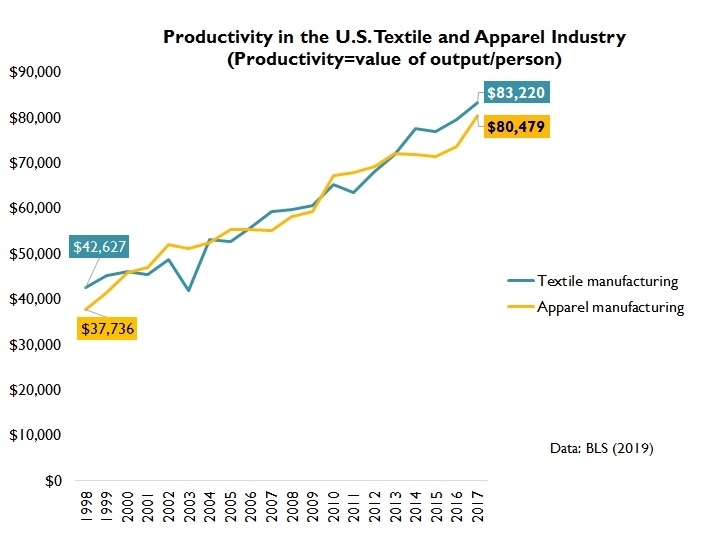 For example, textiles had accounted for over 80% of the total output of the U.S. textile and apparel industry as of 2017, up from around 50% in the late 1990s. 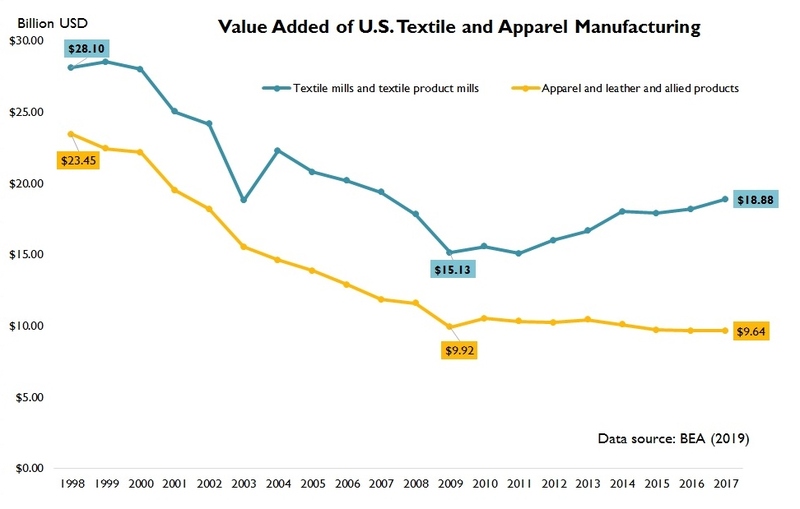 Meanwhile, clothing had only accounted for 12% of the total U.S. fiber consumption in 2012 (the latest data available), whereas the manufacturing of non-apparel textile products in the United States, such as industrial and technical textiles, has been growing particularly fast over the past decade. 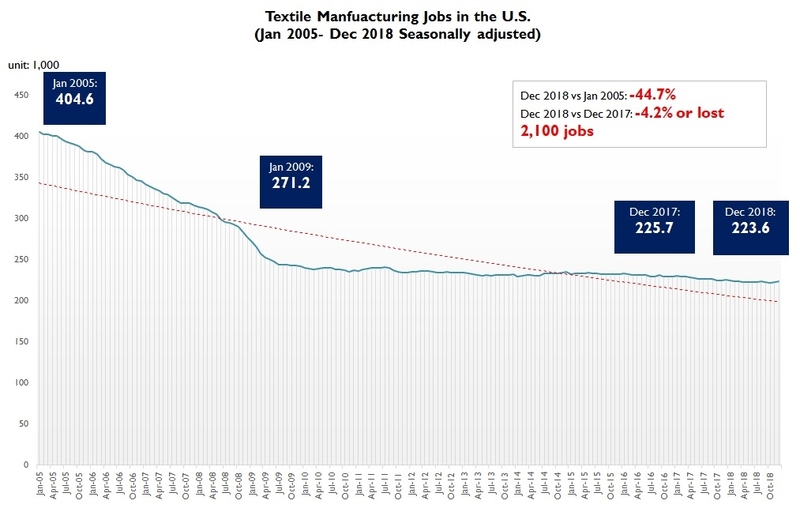 Manufacturing jobs are NOT coming back to the U.S. textile and apparel industry. 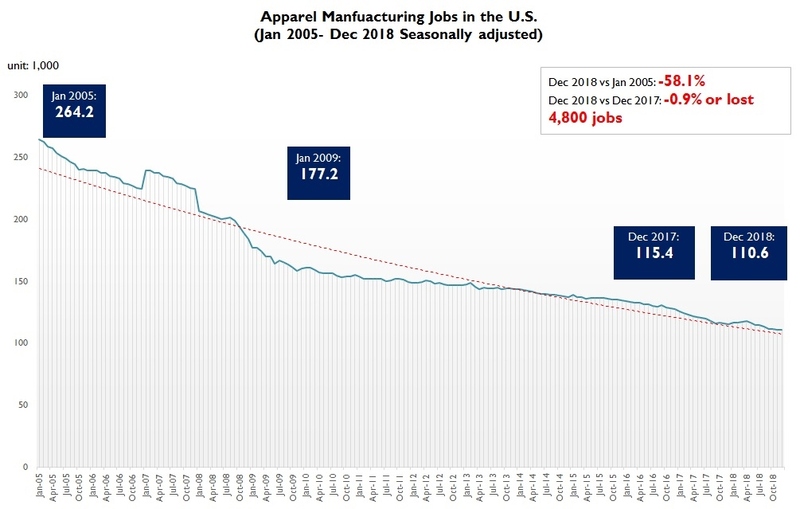 In 2018, U.S. textile manufacturing (NAICS 313 and 314) and apparel manufacturing (NAICS 315) lost 2,100 and 4,800 jobs respectively. However, improved productivity is one critical factor behind the job losses. Regarding international trade, the United States remains a leading textile exporter and apparel importer overall. Interesting enough, both the value of U.S. textile and apparel imports enjoyed much faster growth in 2018 than in the previous years. 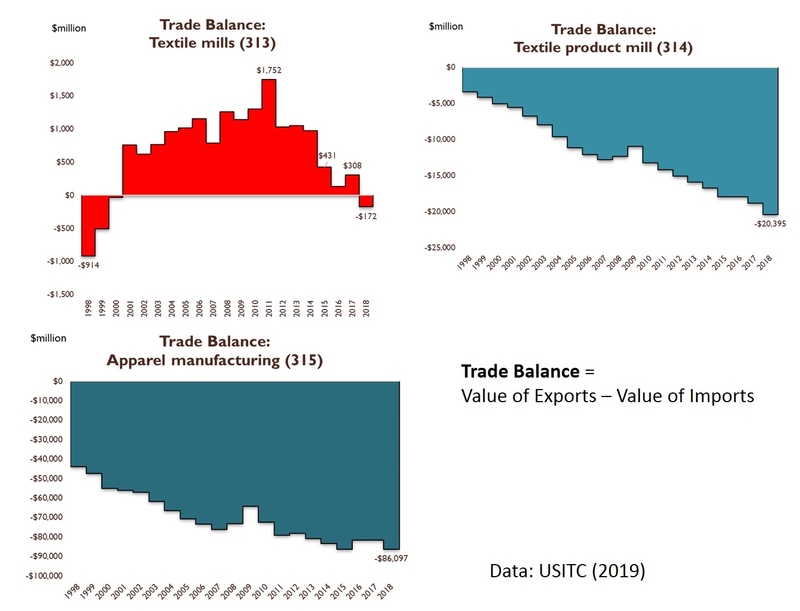 Notably, for the first time since 2001, the U.S. textile sector (NAICS 313) experienced a trade deficit ($172 million) rather than a trade surplus. Meanwhile, the U.S. trade deficit in apparel (NAICS 315) reached $86,097 million in 2018, up nearly 6% from a year ago. These unusual trade patterns could be partially affected by the U.S.-China tariff war, which didn’t seem to be helpful with solving the trade deficit concerns. The UK government on March 13, 2019 released the temporary rates of customs duty on imports if the country leaves the European Union with no deal. In the case of no-deal Brexit, these tariff rates will take effect on March 29, 2019 for up to 12 months. According to the announced plan, around 87% of UK’s imports by value would be eligible for zero-tariff in the no-deal Brexit scenario. Specifically for apparel products, 113 out of the total 148 tariff lines (8-digit HS code) in Chapter 61 (Knitted apparel) and 145 out of the total 194 tariff lines (8-digit HS code) in Chapter 62 (Woven apparel) will be duty-free. However, other apparel products will be subject to a Most-Favored-Nation (MFN) tariff rate ranging from 6.5% to 12%. Meanwhile, the UK will offer preferential tariff duty rates for apparel exports from a few countries/programs, including Chile (zero tariff), EAS countries (zero tariff), Faroe Islands (zero tariff), GSP scheme (reduced tariff rate), Israel (zero tariff), Least Developed Countries (LDC) (zero tariff), Palestinian Authority (zero tariff), and Switzerland (zero tariff). On the other hand, the EU Commission said it would apply the Most-Favored-Nation (MFN) tariff rates on UK’s products in the no-deal Brexit scenario rather than reciprocate. Appendix: UK’s MFN tariff rate for apparel products (HS Chapters 61-62) in the case of no-deal Brexit. USMCA vs. NAFTA1.0: The USMCA will continue to adopt the “yarn-forward” rules of origin. The USMCA will also newly require sewing thread, coated fabric, narrow elastic strips, and pocketing fabric used in apparel and other finished products to be made in a USMCA country to qualify for duty-free access to the United States. U.S. textile industry: U.S. textile manufacturers almost always support a strict “yarn-forward” rules of origin in U.S free trade agreements and they support eliminating exceptions to the “yarn forward” rule as well. The National Council of Textile Organization (NCTO) estimates that a yearly USMCA market for sewing thread and pocketing fabric of more than $300 million. U.S. apparel and retail industries: The U.S. apparel industry opposes “yarn forward” and argues that apparel should be considered of North American origin under a more flexible regional “cut and sew” standard, which would provide maximum flexibility for sourcing, including the use of foreign-made yarns and fabrics. USMCA vs. NAFTA1.0: With some adjustments, the USMCA would continue a program that allows duty-free access for limited quantities of wool, cotton, and man-made fiber apparel made with yarn or fabric produced or obtained from outside the NAFTA region, including yarns and fabrics from China and other Asian suppliers. 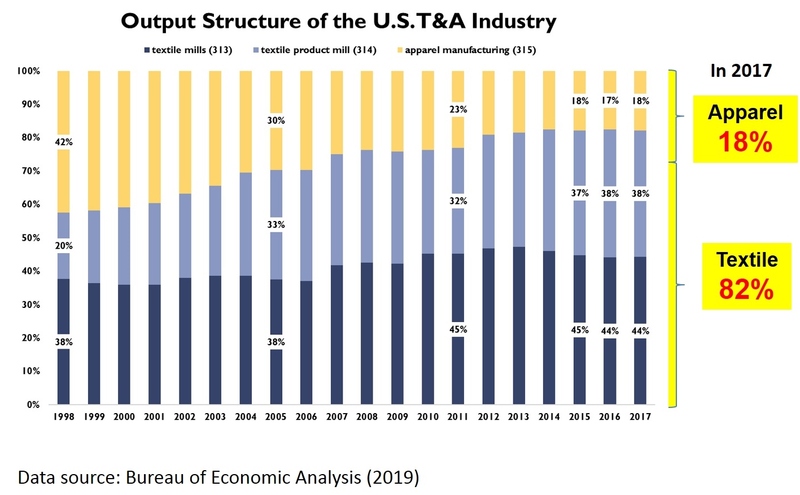 U.S. textile industry: The textile industry contends China is a major beneficiary of the current NAFTA TPL mechanism, and it strongly pushed for its complete elimination in the USMCA. U.S. apparel and retail industries: U.S. imports of textiles and apparel covered by the tariff preference level mechanism supply 13% of total U.S. textile and apparel imports from Canada and Mexico. Apparel producers assert that these exceptions give regional producers flexibility to use materials not widely produced in North America. U.S. textile industry: The U.S. textile industry also opposes the USMCA newly allows visible lining fabric for tailored clothing could be sourced from China or other foreign suppliers, and it would permit up to 10% of a garment’s content, by weight, to come from outside the USMCA region (up from 7% in NAFTA1.0). The U.S. textile industry also welcomes that the USMCA would add specific textile verification and customs procedures aimed at preventing fraud and transshipment. Additionally, the U.S. textile industry is also pleased that the USMCA would end the Kissell Amendment. The Kissell Amendment is an exception in NAFTA that allows manufacturers from Canada and Mexico to qualify as “American” sources when Department of Homeland Security (DHS) buys textiles, clothing, and footwear using appropriated funds (about $30 million markets for textiles, clothing, and shoes altogether). U.S. apparel and retail industries: Apparel importers are of concern that the USMCA continue to incorporate the existing NAFTA short supply procedure, which is extremely difficult to get a new item approved and added to the list, limiting their flexibility to source apparel with inputs from outside North America. Stage 3: after a total of twelve months in stages 1 & 2, the EU Commission will conclude the procedure with a final decision on whether or not to withdraw tariff preferences; it is also at this stage that the Commission will decide the scope and duration of the withdrawal. Any withdrawal would come into effect after a further six-month period. Developed in 2001, the EBA program establishes duty-free and quota-free treatment for all Least Developed Countries (LDCs) in the EU market. EBA includes almost all industries other than arms and armaments. As of February 2019, there are 49 EBA beneficiary countries. 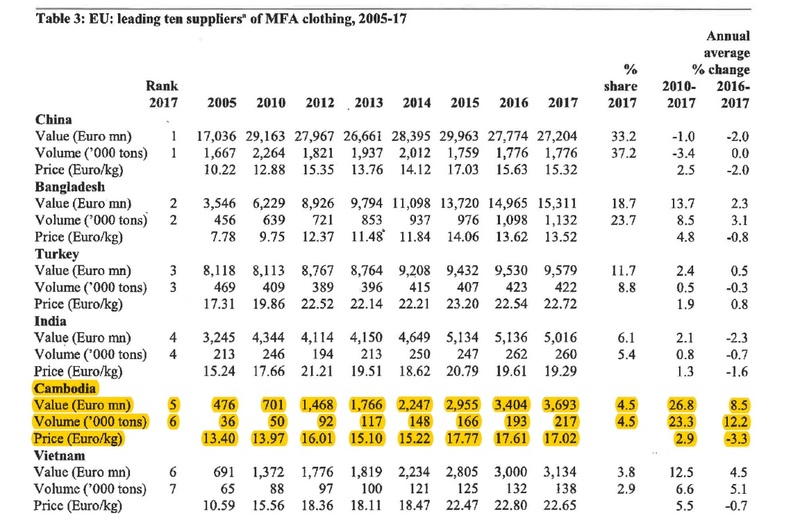 The EBA program has benefited the apparel sector in particular given clothing accounts for the lion’s share in many LDCs’ total merchandise exports. Because of the preferential duty benefits provided by EBA, many LDCs can compete with other competitive apparel powerhouses such as China. Notably, the EBA program also adopts the “cut and sew” rules of origin for apparel, which is more general than the “double transformation” rules of origin typically required by EU free trade agreement and trade preference programs. Under the “cut and sew” rule, Cambodia’s apparel exports to the EU can enjoy the import duty-free treatment while using yarns and fabrics sourced from anywhere in the world. Cambodia is a major apparel supplier for the EU market, accounting for approximately 4% of EU’s total apparel imports in 2017. Exporting apparel to EU through the EBA program is also of particular importance to Cambodia economically. In 2016, the apparel sector created over 500,000 jobs in Cambodia, of whom 86% were female, working in 556 registered factories. According to Eurostat, of EU’s €4.9bn imports from Cambodia in 2017, around 74.9% were apparel (HS chapters 61 and 62). Meanwhile, of EU’s €3.7bn apparel imports from Cambodia in 2017, as high as 96.6% claimed the EBA benefits. Understandably, losing the EBA eligibility could hurt Cambodia’s apparel exports to the EU significantly.